Choose from a wide selection of Men's Golf Caps & Hats embroidered with your logo. Each Men's Golf Caps & Hats are customized with your logo or personalized with your branded message for your next golf tournament, event, or outing. 4. Your Men's Golf Caps & Hats will be produced and shipped followed by a tracking number sent by email. The Rockdale Classic Soft Crown Cap. This classic cut traditional cotton cap is our #1 selling style. The unstructured form with cloth strap and metal grab is sized for average to deeper head depth. .. Constructed Heavy Brushed Cotton Twill Cap - Golf Tournament Gifts.. Constructed Lightweight 2-Tone Cotton Twill Sandwich Cap - Golf Tournament Gifts..
Personalized Golf Visors Washed Twill - Golf Tournament Gifts..
Nike Golf Technical Colorblock Cap. Built to Nike Golf's exacting standards, this lightweight cap is engineered for enduring performance. This cap is lightly structured with a low profile design and a hook and loop closure. The color-block detail is enhan..
Only Nike Golf could engineer a moisture-wicking cap this flexible and stylish. This cap has a contrast sandwich bill and a structured, mid-profile design. The Swoosh Flex sweatband ensures an exceptional fit. The contrast Swoosh design trademark is embro.. 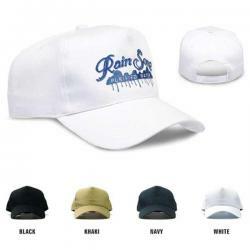 Contrast stitching makes this cap stand out, while a water resistant finish combats moisture. This cap has an unstructured, low profile design and a hook and loop closure. The contrast Swoosh design trademark is embroidered on the front. Made of 100% poly.. This 100% solid color fleece beanie is approximately 8" long, and 1 size fits all. 8" L..